Happy autumn. Here's a short, sharp interview with Richard Godwin. PDB: How did you research your latest book/ short story? PDB: Which of your publications is the most successful? Apostle Rising, largely because it is the first and has had more time to get rolling, great sales and foreign rights. Second, Noir City. PDB: What’s your favourite film/ book/ song/ television programme of 2015? I do not have one now that I think of it. I have just signed for publication of my next novel, out next June. It is narrated in four different genres. 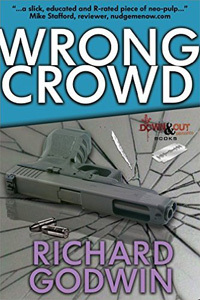 Bio: Richard Godwin is the critically acclaimed author of Apostle Rising, Mr. Glamour, One Lost Summer, Noir City, Meaningful Conversations, Confessions Of A Hit Man, Paranoia And The Destiny Programme and Wrong Crowd. His stories have been published in numerous paying magazines and over 34 anthologies, among them an anthology of his stories, Piquant: Tales Of The Mustard Man, and The Mammoth Book Of Best British Crime and The Mammoth Book Of Best British Mystery, alongside Lee Child. He was born in London and lectured in English and American literature at the University of London. You can find out more about him at his website www.richardgodwin.net , where you can read a full list of his works, and where you can also read his Chin Wags At The Slaughterhouse, his highly popular and unusual interviews with other authors. Paul D. Brazill is the author of Guns Of Brixton, Cold London Blues, and Kill Me Quick! He was born in England and lives in Poland. He is an International Thriller Writers Inc member whose writing has been translated into Italian, German and Slovene. He has had writing published in various magazines and anthologies, including The Mammoth Books of Best British Crime. He has edited a few anthologies, including the best-selling True Brit Grit – with Luca Veste. His blog is here.